Prime Minister Narendra Modi’s address to the nation on the country’s successful anti-satellite missile test was “avoidable”, but may not have violated the Model Code of Conduct (MCC) in the strictest sense, sources in the Election Commission told The Indian Express. The EC, however, directed a committee of four officers Wednesday to examine the matter thoroughly in “light of the Model Code of Conduct” to ensure official machinery and government office were not misused to the advantage of the ruling party. The officers are expected to submit their report this week. Although the EC’s permission wasn’t sought before the address was aired Wednesday afternoon, sources said the government was under no obligation to approach the panel since it did not directly use public broadcasters — Doordarshan and All India Radio — for the purpose. 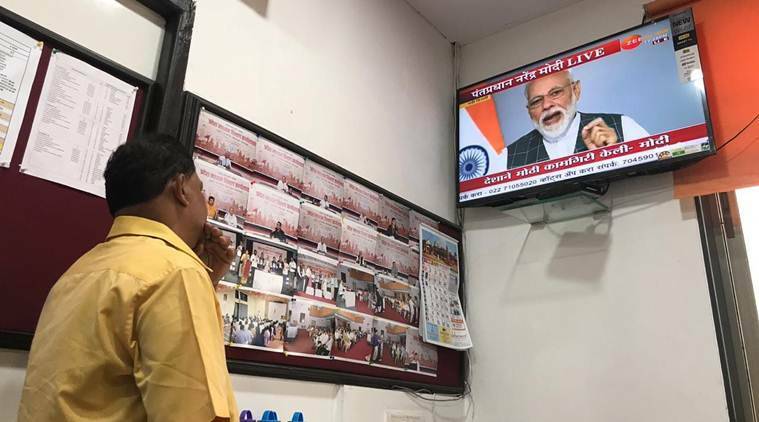 The EC is learnt to have crosschecked with Doordarshan whether it had recorded and aired the PM’s address and was informed that the channel only used pre-recorded feed from a private news agency. “The government has sought permission in the past to use AIR for airing ‘Mann ki Baat’. Since the public broadcaster wasn’t used this time, they didn’t have to approach (EC),” said an EC official. The EC committee, sources added, will examine the transcript of the PM’s address. However, since Modi neither made any new policy announcement nor give his government or party credit for the development, he is unlikely to be found guilty of any violation, The Indian Express has learnt. Earlier Wednesday, the EC held “internal consultations” on the Prime Minister’s address. Senior officials said comments from the government, if needed, could be sought on the circumstances and urgency for the address. EC officials told The Indian Express that what is already under examination are the precedents of such an address shortly before the Lok Sabha polls and whether “national security” could be invoked to explain its urgency. EC sources said they would also be looking into the “origins” of the address to find out if the coordination and preparations were done within the Prime Minister’s Office or the Ministry of Defence. Meanwhile, Opposition parties, TMC and CPM, claimed that the Prime Minister’s address was a violation of the poll code. While CPM general secretary Sitaram Yechury sent a letter to the EC, TMC supremo Mamata Banerjee said her party will lodge a complaint with the EC. Speaking on the issue, Congress spokesperson Randeep Surjewala said “that is a question which the Election Commission should answer”. “We are verifying whether permission was taken by the Prime Minister and after examining that, after our legal department takes a look at it. We will take appropriate action,” he said. “Such a mission should normally be announced to the nation and to the world by the relevant scientific authorities like the DRDO. Instead, the Indian Prime Minister has taken the route of an address to the nation in making this announcement. This announcement comes in the midst of the ongoing election campaign where the Prime Minister himself is a candidate. This is clearly a violation of the Model Code of Conduct,” Yechury said.